Comfortable, shoulder pad of silicone-treated, suede leather lock-stitched over a neoprene rubber pad. Integral thumb loop reduces hand and arm fatigue; helps control the rifle on rough terrain. Includes Talon"! Q/R swivels. 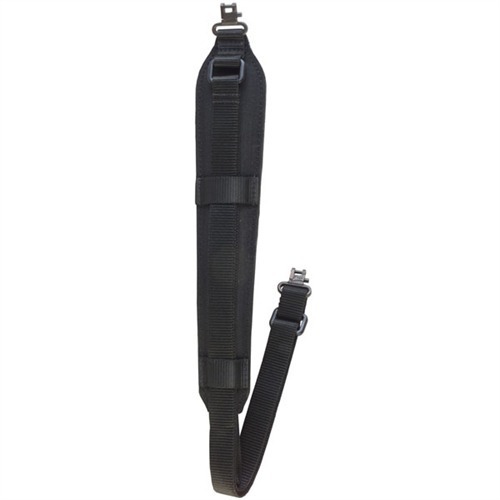 Go from carry to shooting sling without buckles or hooks. SPECS: Mil-Spec nylon webbing, black. 1" (2.5cm) wide adjusts from 23½" to 33½" long. I have one on a Benelli Nova tactical 12ga.. It can be quickly pulled tight, or has enough adjustment to be looped around support arm for additional support when firing off-hand. Comes with Talon quick disconnect sling swivels, which are absolutely marvelous(handling 3 1/2" shells in aforementioned stance). The inner surface of padding is real rawhide too. This was one of those "hidden gems" I'm glad I purchased 1/2 blind. Just what I needed for my 444 Marlin. It's easy to adjust and the swivels are easy to install/remove. Don't look any further. This is probably the worse sling I've used. It is adjustable, but how it adjusts is counter intuitive. Pull the top outer loop down loosen- to a point, then it somehow starts tightening again. Pull the inner loop down to tighten. Worse part, if using on a full length rifle, even full adjusted outward- it's still not long enough to loop over your body to sling the weapon across your back. It will fit your shoulder about it. I purchased this sling for a hunting rifle. I am of average build 160-175 lbs. This sling is easy to adjust, if you read the directions and familiarize yourself with them. It is very useful as a support when wrapped around your support arm for stabilization. Very comfortable and well made.